My hair is naturally wavy/curly so when it was long I washed it and styled it daily because it didn’t look good after I slept on it. Now that it’s shorter, and too short to look good with my natural curls, I straigthen it. But (1) straightening my hair daily is a lot of work, and (2) washing coloured hair daily is not good for the colour. So I only really got into using dry shampoos this year, or more specifically this spring after starting to colour my hair (I had [almost invisible] purple highlights before I went red). Dry shampoo is now my hair’s best friend! 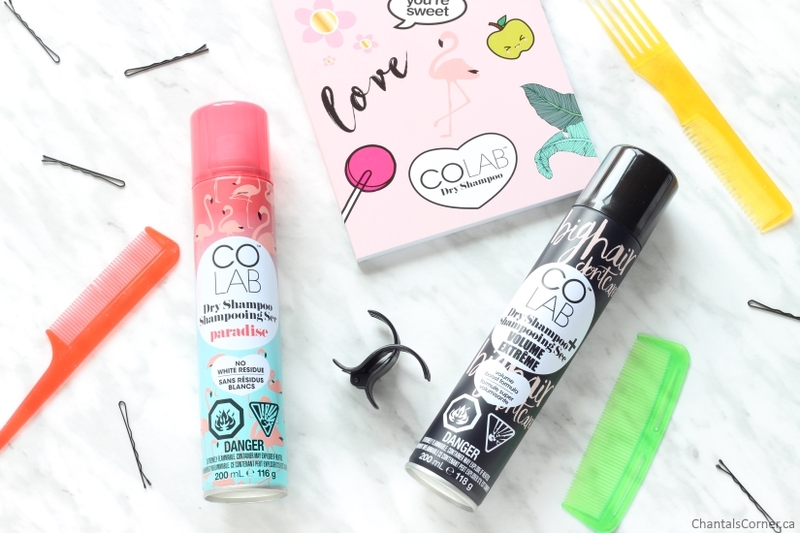 COLAB is a popular brand of dry shampoos found at many drugstores (SRP $9.99 CAD). They have recently gotten a new look and today I’ll be sharing two of their dry shampoos with you: Paradise and Extreme Volume. Before I talk about these products let’s first look at what goes into them, for those who are curious (like me). Butane, Isobutane, Propane, Alcohol Denat amic|solv|vc, Aluminum Starch Octenylsuccinate vc, Parfum (Fragrance) perf, Butylphenyl Methylpropional perf, Benzyl Alcohol pres|perf|solv|vc, Benzyl Salicylate perf, Limonene perf|solv, Linalool perfHover the mouse / tap over an ingredient for short explanation. Read more on INCIDecoder. Butane, Isobutane, Propane, Alcohol Denat amic|solv|vc, Aluminum Starch Octenylsuccinate vc, Talc abrasive/scrub, Silica vc|abrasive/scrub, Dicocoylethyl Hydroxyethylmonium Methosulfate, Propylene Glycol h|solv|vc, Parfum (Fragrance) perf, Citronellol perf, Limonene perf|solv, Geraniol perf, Hexyl Cinnamal perf, Hydroxycitronellal perfHover the mouse / tap over an ingredient for short explanation. Read more on INCIDecoder. 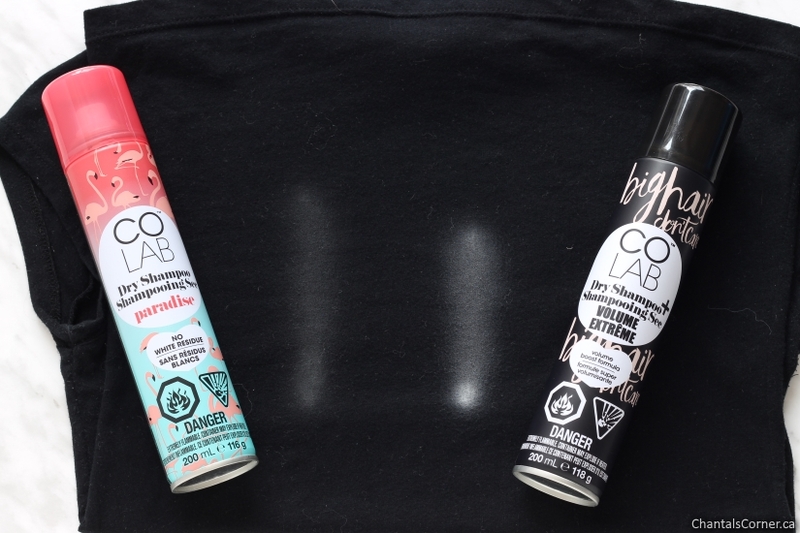 COLAB’s Extreme Volume Dry Shampoo + gives lifeless hair an instant backcombed boost for amazing body and oomph. Big Hair, Don’t Care! This is the fist one I tried out of the two, and also the first volume boosting dry shampoo I try, ever. And I have to say that it was love at first try! It really does help add volume at the roots and my hair isn’t as flat anymore. It feels like I teased my hair at the roots and added hairspray; I cannot even pass my fingers though my hair. But it doesn’t look like a tangled mess, it’s just added volume. I even started using this one on freshly cleaned hair because I just love the volume that it adds. I really enjoy its scent too, but I’m having a hard time describing it. It’s kind of fresh with a hint of floral, but at the same time a bit musky. I like it. 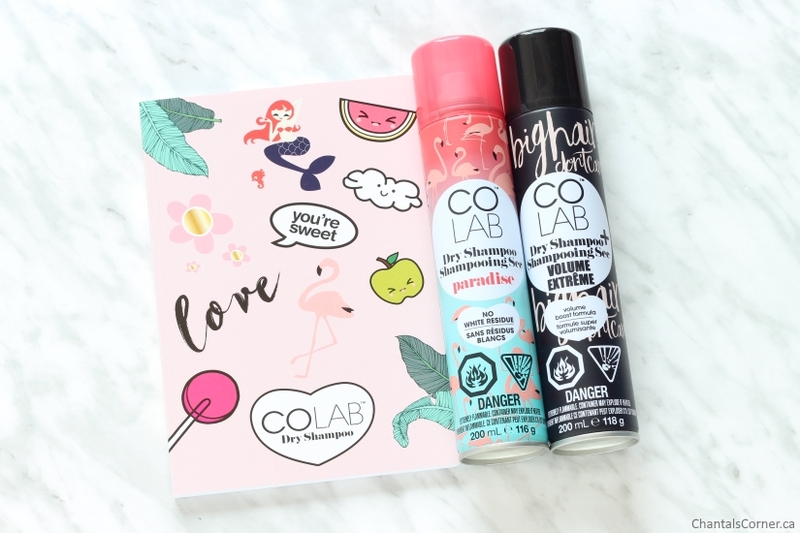 COLAB’s Paradise fragrance Dry Shampoo gives hair an instant wow-factor with feel-good flamingo vibes and a totally tropical, coconut scent. Transport yourself to faraway shores whatever the weather! I was looking forward to trying this one because I LOVE coconut scented products, but there’s just something about this one that doesn’t appeal to me. I do get a coconut/tropical scent from it, but there’s something else with it that I can’t quite put my finger on, and I just don’t like it. Scents are very personal and subjective though so you really have to smell it for yourself to see if you’ll like it. It still works well though. It doesn’t add volume like the Extreme Volume one since it’s not meant for that, but it helps freshen up second + day hair. For those curious, I sprayed a black shirt with both of these to see how much whiteness they would give and this is the result. The Extreme Volume one does create a bit of whiteness in my hair, but I just fluff my hair with my fingers a bit and it disappears. The Paradise one doesn’t appear white in my hair even though it did appear a little bit white on the shirt. I found a new favourite dry shampoo with the Extreme Volume because I REALLY like the boost that it gives to my roots. COLAB has so many scents and I want to try them all! They even have a Mermaid scent that is exclusive to Boots UK – I need to find a way to get my hands on that one.